If your student or child needs to practice writing in manuscript in very large letters, then this page is for you. The 93 printable manuscript handwriting lessons on this page feature the following points. Other features are listed with each set. 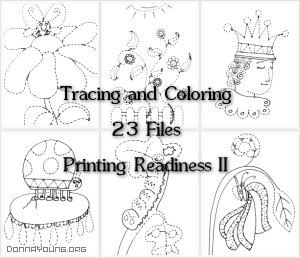 Optional: Use these after using the Printing Readiness Handwriting Worksheets. In this set, you can choose to teach the A as a 3-stroke letter or choose the file Aa na for no arrows. You have the similar choice with M: a 2-stroke M or one with no arrows. The N can be draw in 1, 2, or 3 strokes, however; this set presents the N as a 2-stoke character. This matches the way the M is drawn in the Mm2 file. Of course you can "white-out" the arrows on the N and any other letter and teach your child the way that you think is best. If you want to introduce letters by the direction of a pencil stroke or shape see chart on the Suggested Schedules page. The lessons can be given as needed or use one of the schedules listed at Schedules for Beginning Manuscript Handwriting Lessons. The student should trace the letters and then write the letter at least once on the line. Oo R means uppercase letter "O" is round rather than oval. Tt H means the lowercase letter "t" has a hook. The rule height in this set is around 1 3/8 inch tall. The right margin will have the featured letter in a much smaller size in case the child wants to practice writing smaller. The student should trace the first letter and then writing the letter on the line as many times as will fit. Set Three is the practice set. The letters have no asrrows and except for the small letters on the sides and there are no repeating letters. The rule height in this set is around 7/8 of an inch tall. The 28 lessons are linked below. After completing one or all of the sets on this page, and if the student did well, you may move on to the Words set if you want to continue with LARGE letter handwriting lessons. If your student needs more work in forming letters, try the Targeted set. If you want handwriting lessons in a smaller letter size, visit the handwriting chart page; it lists my manuscript handwriting sets by size, however; it might not be up-to-date. Compare Rule Height This is a chart that compares the letter height of some of my handwriting worksheet sets.